Chimneys warm as Winter settles into Wrightwood. Once again the mountains change, this time to white. The vibrant colors of Fall fade as leaves fall to the ground and are buried under an average of snowfall of 53 inches. While there's plenty of snow, the temperatures rarely drop below the 20's. 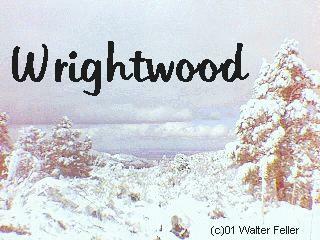 As quiet as the snow will will make a landscape, Winter is Wrightwood's busiest season. Mountain High (East & West) and Ski Sunrise are the most convenient ski resorts for the largest concentration of skiers in the world. Just 90 minutes from Los Angeles, skiers can reach Wrightwood's over 400 acres of skiing without driving on narrow, twisting mountain roads. The roads are cleared quickly as ski rental shops, restaurants, lodging establishments and residents prepare to welcome snow players, snow sculptors, sledders, skiers and snowboarders to our cozy little village. Cross country skiers and snow-shoe hikers visit familiar terrain that looks completely different. A new kind of peace covers the forest. There's the crunch of snow under foot, the extra quality of given a hot cup of cocoa, there are children with sleds, warm bundly clothes, icicles hanging from the rooftops and sweet wood smoke from the chimneys.